We live in a connected world. Thanks to the rise of smart technology, we have now become part of the world where our devices are getting smarter and things have become a lot more convenient than ever. Whether it is your airline booking where you book a flight automatically based on your perforce because your last flight got canceled or your car telling you that it’s time get serviced as the engine oil is low – things are no longer the same anymore as they used to be in the past – everything is interconnected, or say, we are all connected with the internet of things. Amidst this customer-centric revolution, Salesforce has emerged as a platform that has transformed the way businesses were being run in the past. 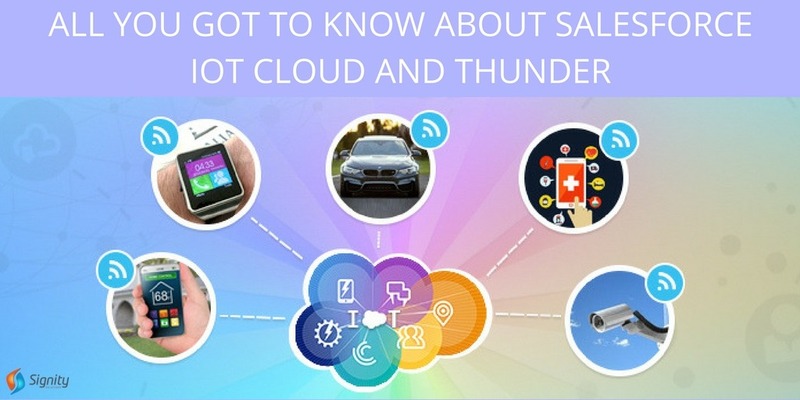 And, the Salesforce IoT Cloud, powered by Thunder, comes as part of this revolution. Built to help business connect their customers with the Internet of Things, it comes across as a scalable processing engine that can help the business grow bigger and better leveraging the IoT data that’s streaming from the Internet-connected products that customers are using in their day-to-day life. From listening to the customers to triggering actions based on that and proactively engaging them – the system will help you do all that! Gathering the correct numbers and data is the most important and complex thing for a business. IoT Cloud by Salesforce helps you capture real-time events and also the numbers associated with these events at every personal scale. Whether you talk about website engagement of the customer or device usage, or stuff like email history as well – IoT Cloud can capture it all! It also empowers you to filter the irrelevant numbers and keep only the ones that are of use to you assemble them and create a 360-degree profile of customers/devices they are using. Once you have access to relevant business data, you can go ahead and plan further business actions by building extensible rules based on the 360-degree customer/device profile that you have created using the data. The IoT cloud lets you rapidly build, test and iterate plans with just a few mouse clicks. IoT cloud makes your business smarter and more intelligent as you can set a response/trigger action based on changes in the data that you are gathering. So in a way, it’s like adding intelligence to your business! You can go ahead and trigger a workflow in sales cloud or create a case as well. You can interact with employees via Chatter, again leveraging the power of marketing cloud in Salesforce. Related Post: Why Service Cloud over any other support optimization platform? And, do a lot more! To sum up, IoT Cloud from Salesforce comes across as a revolutionary technology that lets you connect your IoT data from all devices so that you can leverage the information to its full extent, and further use to it build better business processes keeping your customer in the center. So, are you ready to manage the key aspects of your business i.e. sales, service, and marketing, in a better and more efficient manner? Want to explore more about the hidden potential of IoT from Salesforce? If yes, then we at Signity Solutions can help. Being one of the most respected and reputed Salesforce Development service providers in India, we can be your trusted partner to make the most of IoT from Salesforce and take your business to the next level!